Our travels for the fall are not over yet. We're not really the type to take a lot of summer vacations because we're not bound by school schedules (as of yet.) We really are enjoying the freedom and flexibility to explore when everyone else is in school so that we can avoid crowds and the-height-of-vacation-season-traveling-costs. It IS fun to travel (more so once the children are all sleeping through the night.) I think I like to travel more in my head than in actuality at the moment (Diapers? Check! white noise maker? Whoops! Forgot to pack that!) but it's fun to dream and plan for the future. 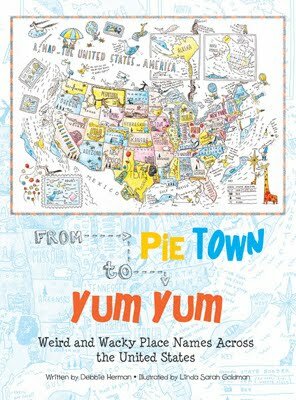 This book takes you alphabetically through the states, pointing out odd names for towns and cities, and giving you a brief history of how each one received its name. It is filled with cartoons to illustrate absurdities and, of course, maps to show you where everything is located. It's a curiously clever book, new from Kane Miller, and caught my attention in their new release line-up. It's just plain awesome, that's what! Definitely not Dull Center, Wyoming. (Sorry. I couldn't resist.) Just plain good fun in a crazy sort of way, leaving you wondering about the people who named these places! If you're curious - take a peek! And next time you find yourself on a road trip you might want to jot down the names of the towns you pass through. It's a crazy world out there! Thanks, Kane Miller, for sending me a copy of this book to peruse and enjoy! That sounds like a of of fun. I can't remember coming across any weird town names while traveling, but I did see a road sign once for "Old Old Highway 11." To distinguish it from Old Highway 11, I guess. That sounds like exactly the kind of book I would read! Especially when planning my vague "sometime in the future" trip all the way down Route 66. I'm going to put this on my "to-read" list! What a fun book! Sounds great to use with geography or a road trip for my little guys. I like your comment about travelling in your head. It is alot less work that way! What a fun concept! I love those trivia-type books--and this one sounds like a rather good one. I'll have to look it up. This reminds me of a poem in a children's poetry collection that Louise LOVED and I thought I reviewed, but alas, it must have been one of those books I intended to review but never got around to. This one sounds delightful! This book sounds like fun. It reminds me of community (much to small to be called a town) near here called "Lucknow". We joke that the founders must have stumbled upon water, food or shelter and exclaimed, "We're in luck now!" If you liked this, you would probably enjoy Names on the Land by George R. Stewart.